We all think we know what photographs are, and why we have them. Photographs are everywhere. For the past 150 years they have penetrated, entangled and perhaps defined almost every area of human endeavour that we care to name – medicine, industry, tourism, relationships, archaeology, social policy – and that’s just for starters. They have rendered both the visible and invisible in certain ways that have shaped our world. 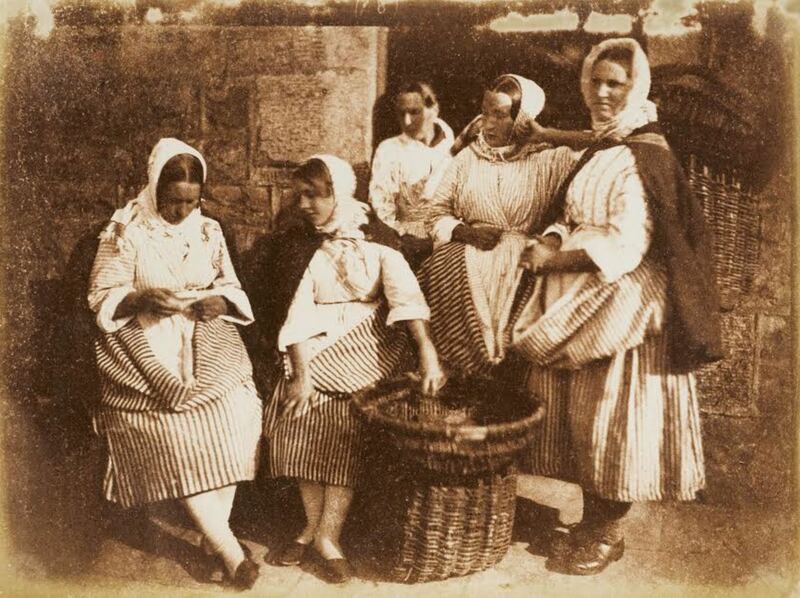 David Hill & Robert Adamson, Five Newhaven Fisherwomen, c. 1844. Some of the earliest efforts to represent that world are to be found in the Tate Britain’s new exhibition Salt and Silver, featuring salt prints taken between 1840 and 1860. Salt prints are the result of the first negative/positive process that made photography the reproducible form with which we are familiar. They are beautiful and jewel-like, their photographic chemicals absorbed deep into the fibres of their papers. It gives them a softness which, combined with fading caused by chemical instability, produces ethereal qualities quite unlike anything else. These are precious, connoisseurial objects, the exhibition strap-line – “rare and revealing” – makes that clear to us. 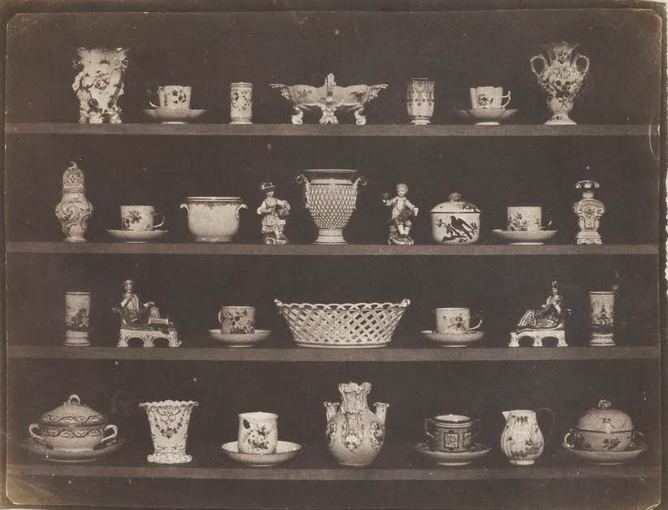 But these fragile and precious prints (they cost a fortune at auction) caused me to ponder the kinds of photographic histories are presented to the public. Why does the default value of photography always seem to be “art”? This implies that photography’s ultimate purpose is aesthetic discernment and expression. But I don’t think that this alone communicates the importance or power of photography. This was really brought home to me when I belatedly visited the Science Museum’s Drawn by Light, an array of material from the Royal Photographic Society’s collection. Science and photographic practice were important strands in the exhibition. But these interests slipped almost seamlessly into a narrative of photography’s aesthetic aspirations and the great names of the photographic canon: from Julia Margaret Cameron to Martin Parr. Despite some interesting juxtapositions, somehow they crowded out the other important voices. It’s a shame that this is the photographic history that is told by default. There are hundreds of photographic histories, in science, medicine, architecture, industry. But these are too often shoe-horned into a category called “art” to be made visible or interesting. 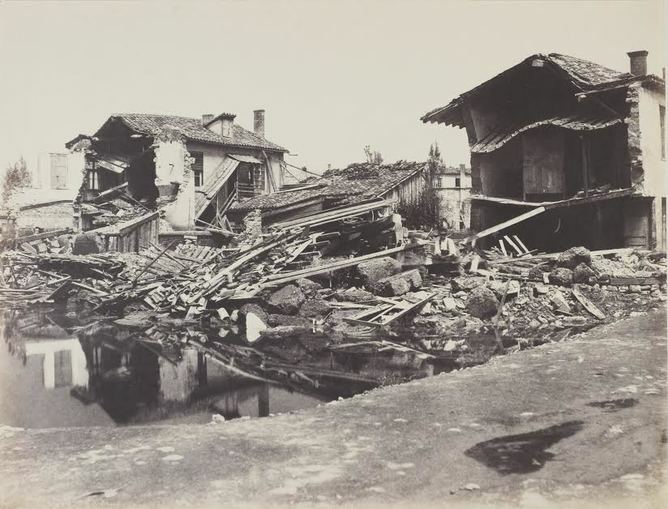 Edouard Denis Baldus, The Floods of 1856, Brotteaux Quarter of Lyon, 1856. Recently I was talking to a colleague working on industrial photographs. These provide a visual narrative of how we have structured an economic base, of practices that have involved the labour of thousands upon thousands of ordinary people (that category beloved of politicians). Fascinating, but nobody wanted to do an exhibition because this was not “art”, he was told. There are a multitude of reasons for this: the institutional and disciplinary investments in making photographs one kind of thing and not another, the siren pull of the art market which dictates what is desirable and important and what is not. But what of the rest – the photographic workhorses that have shaped ideas since the 1850s? While pleasingly evident in new academic work, they are largely written out of gallery agendas, except as the odd foray into “comparative material”. Canons of anything come with a cosy conceptual cogency. They provide frameworks, which save you the hard work of thinking outside the box. Certainly other kinds of photographs intrude into gallery spaces. But they often do so – not because of their intrinsic historical interest, but because they appeal to contemporary aesthetic sensibilities. William Fox Talbot, Articles of China, 1844. It is in this way that some 19th-century photographers have been “recognised” through the application of those sensibilities. 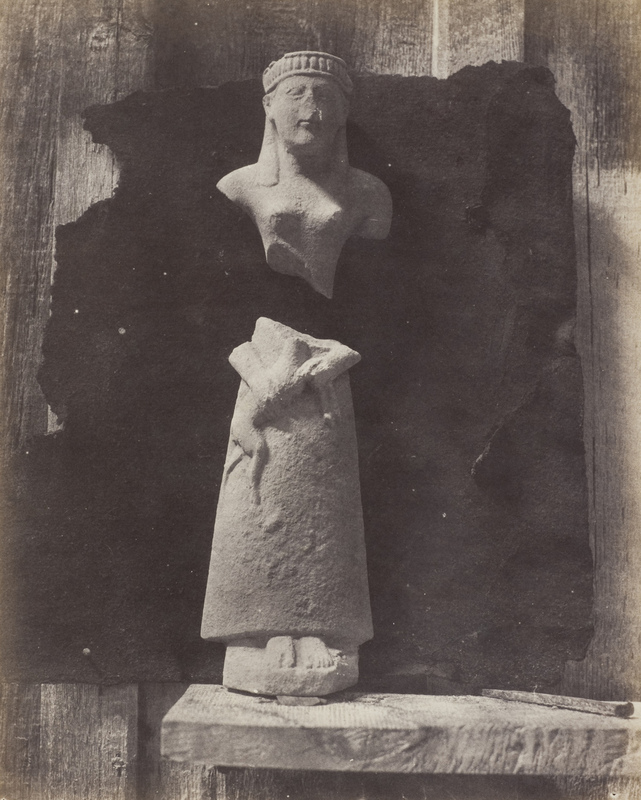 This might be as proto-modernists (Roger Fenton’s The Queen’s Target for example), surrealists (the fascination with a photograph Benjamin Stone took in 1898), post-modernists or whatever. Juxtaposed with contemporary art photography this may be fun and quirky and provide an interesting provocation. But I’m not sure it does anything to explain the richness of photography’s contribution to the way we see the world. It doesn’t challenge us, it doesn’t explain why we, as an exhibition-going public, need to know about it. There are, of course, notable exceptions. Autograph’s brave and ghastly, but historically and emotionally compelling, exhibition Without Sanctuary (2011) on American lynching photographs, was all the more shocking because the photographs were presented as cultural objects, scruffy, damaged postcards that people wrote on and handled. Or the Photographer’s Gallery Mass Observation: This is Your Photo (2013) which integrated photographs with the wider archive. Even more so their current exhibition Human Rights Human Wrongs. But these important forays tend to be stand-alone, issue-led exhibitions rather than integrated into histories of photographic culture. This brings me back to the Tate exhibition. The content of the salt prints is wide and varied, signalling how the all-embracing reach of photography was seeded from the beginning, yet that it tends to get lost in the aesthetic and connoisseurial histories of photography that dominate, as we are asked to contemplate the fine object. Auguste Salzmann, Statuette en Calcaire; Type Chypriot 1858-1865. But the photographs here are more than precious and beautiful objects. Photographs of Middle Eastern antiquities were perhaps part of a desire for scientific archaeological evidence in an imperial age. Others are part of the post-rebellion political need for consolidation through a search for authentic origins of Indian heritage – one later refigured within nationalist frameworks (Linneaus Tripe’s architectural studies in India). Yet perversely the very immediacy of photographs also confronts us with the unknowability of other people’s lives in other ages. That is what makes them so compelling and opens them to possibilities beyond structures of the canon – if we allow them to.